Commissario Soneri of the Parma police in Italy has two strange, simultaneous cases on his hands. In one, an elderly man called Decimo Tonna has plunged to his death from an upper window of the town's hospital. It does not look as if it was an accident. At the same time, in the nearby small town of Torricella on the banks of the River Po, a barge has broken free of its moorings and been carried away in the worst storms and floods that have been experienced in many years. The owner of the boat is Anteo Tonna, the older brother of the dead man. It is presumed that he's on the boat, but when it finally runs aground on a sandbank well upriver, there is nobody on board. Soneri persuades the magistrate, an insecure man permanently on the verge of early retirement, to let him investigate both cases, as he's convinced they are connected despite the lack of evidence to indicate that this is the case. Soneri's only interest during this novel is finding out what is at the bottom of the two mysteries. In the process, he is abrupt to the pathologist, to his sergeant (who he barely sees but bosses around by phone) and to his girlfriend Angela. He is intuitive with witnesses, though, which enables him gradually to uncover more details, though whether they are relevant is as-yet unclear. In the case of the elder brother, Soneri spends much of his time in Torricella, getting to know the small group of boatmen there, as well as hanging out in the two local bars and becoming familiar to the people who run them. He uses the opportunity to sample much local drink and food, including one dish of minced horsemeat, which is not on any official menu but is offered to him in a pencilled note on a piece of paper by the deaf waiter. In Parma, he finds out that the younger brother (a mere 76) spent all his time at the hospital, comforting the elderly patients and being treated almost as a member of staff by the nurses. He never spoke about himself, however, so remains an enigma. The elder Tonna brother, the boatman, is said to be equally reticent but more of a taciturn, reclusive figure. His niece owns one of the bars in town, and her son spent some time trying out a life on the river, but decided against it in preference for a more sociable, and financially viable, career. At least their presence means that Soneri can find out a bit more about the brothers and their family. RIVER OF SHADOWS is a welcome newcomer to the crime fiction genre (in England, at least: it was first published in Italy in 2003). Soneri has many attributes in common with Andrea Camilleri's Inspector Salvo Montalbani, but lacks the warmth of that southern policeman and his sheer ecstasy over his food - which I doubt could be matched by anyone. Soneri's girlfriend Angela is a lawyer who does not want to settle down, but who is mainly keen on finding exciting and dangerous venues in which to have trysts with Soneri, which he finds quite trying especially while he's trying to solve the crimes, but even so, he can't resist. He spends a lot of time travelling back and forth between Parma and Torricella, gradually finding out more about the past and, in particular, the effects of the Second World War and its aftermath on the local population, uncovering many bitter resentments between the Fascists and the Communists over reprisals and various acts of violence, as well as a moving subplot about a village that was sunk as part of a reclamation project immediately after the war. The best parts of this novel for me are the descriptions of the River Po, its ins and outs, its shallows and currents, as the storms threaten to burst its banks and engulf the settlements along its course. The ways of life of the people who have lived there for many years are depicted in loving and realistic detail, with the history, politics and geography of the region and the adaptations of the people absorbingly conveyed. I found the characters themselves somewhat less involving: Soneri is potentially interesting, but needs more time to "gel" sufficiently, I think. I liked his unlikeability, but this is a hard trick for an author to pull off. The solution to the mystery seemed to be rather a long time coming and to depend on many trips round the same group of people to elicit a little more detail each time, and the discovery of evidence that had been overlooked previously. 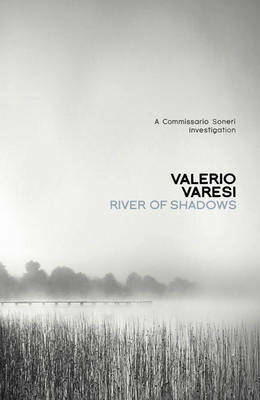 Despite these slight weaknesses, I enjoyed this book very much and look forward to more, as RIVER OF SHADOWS is the first of a series of novels featuring Commissario Soneri, who also is the central figure in a popular TV drama in Italy.